Tamron has put an end to its recent teaser campaign by confirming the 70-210mm F4 Di VC USD and 28-75mm F/2.8 Di III RXD lenses. The latter optic was first teased last week across the company's social media channels, and this was followed by a second teaser for the former lens just a few days ago. The 70-210mm F4 Di VC USD is intended for users of full-frame Canon and Nikon DSLRs. Key features include a constant f/4 aperture and internal focus, the latter of which means that the lens doesn't extend while focusing to keep the centre of gravity fairly constant. Its 1:3.1 magnification ratio is also said to be the highest in its class. The 20-element, 14-group lens employs a Dual MPU (Micro-Processing Unit), which is said to enable high-speed, accurate AF performance, although this also assists the four-stop Vibration Compensation system in helping to steady images and videos. Autofocus itself is carried out by an Ultrasonic Silent Drive (USD) motor, with the option of full-time manual focus override available. The barrel, meanwhile, boasts a moisture-resistant construction, with a fluorine coating on the front element to help repel water and dirt. Other features include compatibility with Tamron's 1.4x and 2x teleconverters, as well as the company's TAP-In console that allows for firmware updates and fine-tuning and both AF and VC systems. The second lens, the 28-75mm F/2.8 Di III RXD, is a standard zoom designed for full-frame mirrorless cameras. Right now, it appears as though compatibility will be limited to Sony's A7 and A9 models (Leica also manufactures full-frame mirrorless cameras, but Tamron does not cater for this mount). 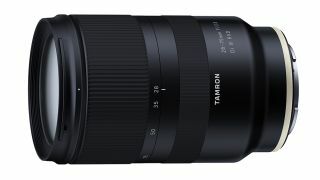 The lens is still under development, and Tamron points out that specs and other details are still subject to change, although it does have a tentative release date of the middle of this year. The lens is the first Tamron optic to incorporate a Rapid eXtra-silent stepping Drive (RXD) AF driving system. Much like Canon's STM system and Nikon's AF-P technology, Tamron states that this is a stepper motor that's remarkably quite in use, which makes the optic suitable for discreet operation while recording video. As with the 70-210mm F4 Di VC USD, the lens also features a moisture-resistant construction and a fluorine coating on its front element. The lens is also compatible with Sony's Direct Manual Focus (DMF) feature, which allows the user to make manual focus adjustments after focus has been determined by the autofocus system. The Tamron 70-210mm F4 Di VC USD will be released in April, with an RRP or £699/$800. Tamron has not disclosed any details as to the price and release date of the 28-75mm F/2.8 Di III RXD lens, save for a mid-2018 release date.